These wood fired industrial boilers are highly efficient – up to 88%, environmentally friendly and are extremely robust in construction. Suitable for hardwood, softwood, and coal fuels. Built-in lifting hook located on top of boiler for ease of installation and handling. 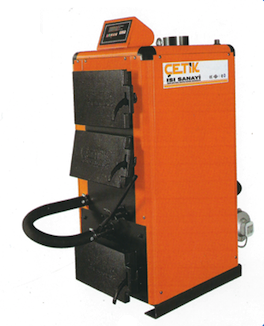 Fan-controlled burning for low smoke emission - Passes the strict European emission standards. Easy to use control panel – includes a display of water temperature, temperature adjustment, fan control, and status lights. All access doors are cast iron with camlock handles. All seals are constructed with ceramic materials – no asbestos used in the boiler. Large fuelling door that allows for long periods between fuelling. 3 or 4 pass heat exchangers for maximum heat transfer from fire to water. Heavy duty ballrace fan. Grate with water passages to improve boiler efficiency and extend grate life. Top door for easy fire passage cleaning. Grate shaker lever to remove ash and turnover grate function - clean grate by simply turning a lever. 3 bar operating pressure. 5 bar factory test on all units.